Last Thursday, I saw a woman in red and green striped tights and a black wool mini skirt. A young boy's Christmas-print pajama bottoms were topped by his everyday jacket and a red scarf. This passes for normal attire in the weeks leading up to Christmas. 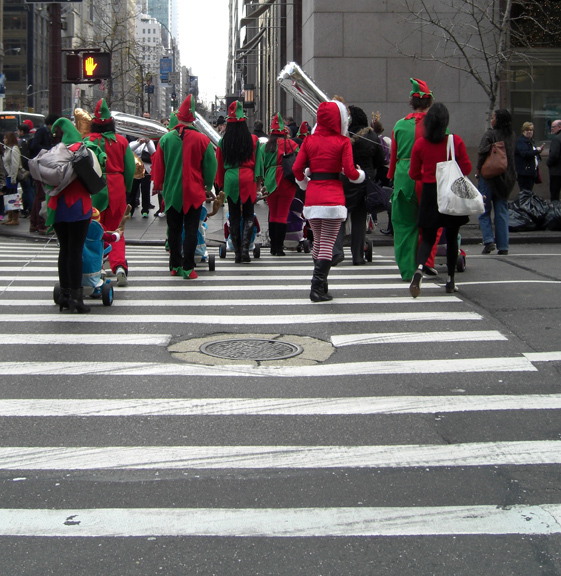 So, while standing at the corner of 5th Avenue and 57th street, it took me a minute to realize that I was in the midst of a crowd of people dressed in elf costumes. Most of them were pushing strollers. 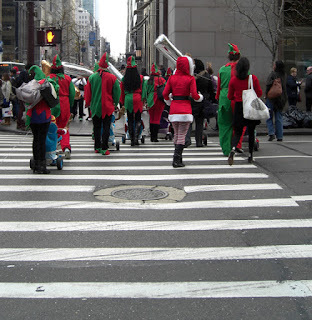 The babies and toddlers were not dressed like elves but some strollers sported holiday decorations. Where were they going? Why were they dressed like that? I'll never know but they gave me one more unique Christmas memory.